I'm not sure why exactly I'm interested in Bigfoot, a so-called cryptid animal that I don't believe in (surely the advent of the cellphone camera signals the end of all belief in him, doesn't it?) and yet I love reading about him. 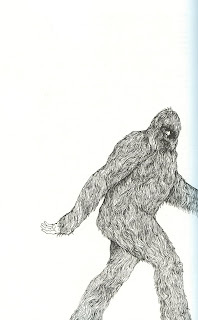 In his new book Bigfoot: The Life and Times of a Legend (University of Chicago Press; 2009), author Joshua Blu Buhs talks about why the creature has proven so attractive to so many people over the years, and I don't really meet any of those criteria. I do know why I picked this particular book up, though: It's fantastic looking. A Matt Avery is responsible for the overall design of the book and the jacket, and the illustrations are credited to a Lauren Nassef, whose work is quite nice in general (Check it out). I love that image. It's a great standalone image, and one that not only catches the eye, but actually captures the contents of the book remarkably well. Buhs isn't a believer either, and explains he was originally drawn to the subject because in his previous work on fire ants he found that he greatly enjoyed writing about an animal subject's interaction with human culture, but was rather frustrated with all of the deep science involved with learning about the animal's actual behavior. An animal that didn't actually exist then seemed to suit his needs perfectly. 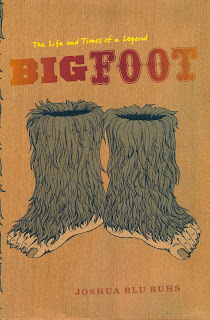 The hoaxing involved in the legend of Bigfoot, from people making fake tracks to at least one fake suit, is suggested by Nassef's cover, as is the the concept of people projecting themselves inside Bigfoot, something Buhs talks about quite a bit. The fur extends to the spine of the book as well, and thus this thing looks cool from whatever angle—face front on a coffee table or nightstand, shelved spine out or even absently left laying on its cover. You can't really tell from the scan, but the front cover also has a faux wooden look, seeming as if the front cover was actually made out of wood. The inside covers and the first and last pages are also wooden looking, although darker, and with a palpable, groove-filled texture. I'm not generally one to fetishize book design, but damn, this is one nice looking book. 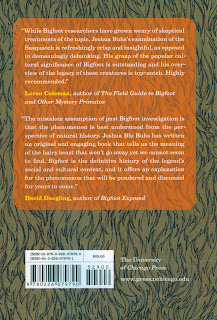 The book itself, by the way, is really great, maybe the best Bigfoot book I've read, replacing Where Bigfoot Walks: Crossing the Dark Divide by Robert Michael Pyle, which addressed the same subject—the cultural history of Bigfoot divorced from the is he or isn't he real debate—from the perspective of a nature writer and environmentalist who was hiking through Bigfoot country. If someone asked me to suggest a book about Bigfoot to them two weeks ago, I would have suggest Pyle's; if you asked me today, I'd suggest Buhs'. Not only is it a good book, but it's a beautiful object as well. J. Caleb Mozzocco is a freelance writer and (extremely) amateur(-ish) artist who lives and works in Ohio. This is his blog. You can reach him at jcalebmozzocco@gmail.com. Creators and publishers who would like their books considered for review here and/or anywhere else he contributes can feel free to contact him at the address above. Editors and publishers of respectable publications who would like Caleb to write about comics for them are also welcome to contact him and offer him work. He loves money. PSA: Attention Ohioans! Your libraries need you! Sometimes I really don't get DC Comics. Ultimates 3: The worst comic book ever?